In the recent years, Cambodia’s growth in the tech and startup scene has spiked, granting locals and businesses access to new technology and services that just a few years ago, no one would’ve thought possible. And as the Kingdom starts to flourish, the fruits of the country’s potential have not gone unnoticed by various investors and companies. Funds such as the Smart Axiata Digital Fund and Cambodia ICT Awards have also been set up to encourage this development. And now, it is safe to say that Cambodia’s budding prospects in the scene have even attracted international audiences after Khmerload’s was recently announced to be the first Cambodian startup to receive investment from Silicon Valley. Launched 5 years ago, Khmerload, an online entertainment news platform for all things viral, has not been short of success stories, with it being the top 3 websites in Cambodia following a successful expansion into Myanmar as Myanmarload, which already has over 3 million followers. Adding to that list is the $200,000 investment from 500 Startups, a global venture capital seed fund and startup accelerator headquartered in Silicon Valley that has invested in over 1,800 companies across the world. Geeks in Cambodia had the chance to sit down with Mr Vichet In (V), co-founder of Khmerload, to learn more about opportunities this investment brings to his team and the Kingdom. Could you let us know more about the recent funding Khmerload received from 500 Startups? V: Back then in June or July last year, we were looking into expansion into another country because we believed that our model could be replicated in other countries. So we decided to send some emails to VCs but we didn’t get any reply. When Tech in Asia had its online pitching session, we pitched our idea there and realised that VCs didn’t believe that Cambodian entrepreneurs could succeed and scale to another country because there were no success stories and it’s a small market. So I decided to expand to Myanmar by boostrapping. We went there, built a page, hired some content staff and did the same model as we have been doing in Cambodia. We managed to reach 4 million page views and decided to look for funding aggressively again. This time, we got the interest of many VCs and there were even companies coming forward trying to get acquisition from us. I decided to look up on various VCs, and found 500Durians 2, which was a Southeast Asia fund from 500Startups. Its managing partner, Khailee, has done something similar to what Khmerload has been doing, and he managed to make a good exit with digital media that focuses on viral news and social media. We decided to pitch to him via email and Facebook messages. Amazingly, he replied and asked us for our business plan and pitch. He made the offer right away after our call. What do you think this investment would mean for Khmerload? V: For Khmerload, with this funding, we can expand more aggressively into another market. That’s what we’ve been doing right now in Myanmar, and we are looking for another market to expand to. We also used this fund to build our content, especially video content, and a sales team. We don’t have a sales team right now and people just contact us to put advertisements on our website. 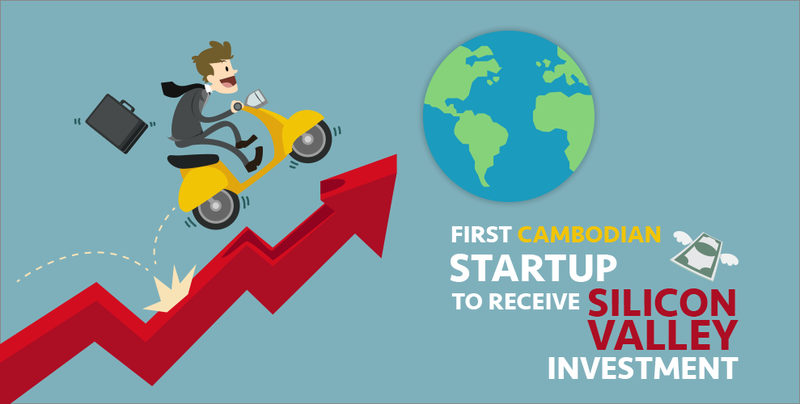 How will this investment help the startup scene in Cambodia? V: It’s a good thing for local startups because it will put Cambodia on the map for international investors since there’s at least one successful story right now. Or at least, it will when we make a good exit, but it’s a step in the right direction and will build up investor confidence in local startups in Cambodia. So hopefully, if we can scale well and make a good exit then there will be more and more investors. I think they (investors) are already starting to look into it. What direction do you see Khmerload heading to now? Are there any upcoming features or expansion that users can look forward to? V: We will produce a lot of video content and more technology-centred content. But not competing with Geeks in Cambodia, because you are English content! (Laughs) We want to track celebrities as well and will build a celebrity database in Cambodia. We will feature a bio and news related to them to make it a good database, allowing users to know who is popular and who isn’t at the moment. It could be a useful database for advertisers in the future. This feature is open to the public but it may be a feature that we can possibly monetize to regional or global users. Also, I think others are also doing such a feature such as Celebrity Wiki, but they don’t cover all celebrities. So what we intend to do is cover all celebrities. We have already started to roll out this feature on our sister sites. Khmerload is often compared to Buzzfeed; what would you say are the similarities and differences that they have? V: I think the similarities are that we focus on viral topics. And entertaining content for the millennial, so it’s the same target audience. But Buzzfeed touches on politics and we don’t. I haven’t read their content for a while so I’m not too sure. What is your strategy when expanding to other countries? V: We have a content management system so we basically copy our platform and use it in another country. We have also started to hire young, passionate writers who can write interesting things. We give them a trial, and if they work well, we hire them. We focus on performance-based systems that allows them to get more pay and bonuses if they do well in terms of content and traffic. Do you usually hire freelancers? V: Yeah. A lot of freelancers actually. Then they become permanent staff later on! (Laughs). Actually, we don’t have an office in Myanmar so it’s basically like they are freelancers. That’s another thing we are looking to do with the fund – get an office in Myanmar in 2-3 months’ time. Now we just have staff working from home or co-working spaces. Previously, you mentioned that you want to expand regionally. Aside from Myanmar, are there any countries that you are looking to expand to? V: We have done a pilot test in Indonesia, but its not going as well as Myanmar. We try to get the maximum value for every dollar spent, so we are focusing on a market that can scale and gain traction very quickly like Myanmar. We are also thinking of expanding into Vietnam and Laos. Vietnam is a very interesting market for us; it’s a big population. For Indonesia, it is a huge population and there are many competitors. So it’s very tough. For now, we intend to test out Vietnam and Laos but it depends on how much funding we will receive in the future. Why did you choose to incorporate Khmerload in Singapore? V: From the investors’ point of view, they are not familiar with Cambodian law. 500Startups suggested that we incorporate in Singapore to position ourselves as a regional player. Not to mention, they also have a better investment protection law. In Cambodia, it’s not very clear because investments have preference share and common shares but in Singapore it is very structured. So many investors feel that it is more secure. What advice do you have for entrepreneurs and startups that are looking for investors to further their businesses and innovation? V: First, if you want to look for funding, you have to identify the investors. You need to be familiar with all the players. You get yourself a list of all the VCs in the region, especially since there are a lot of funds now targeted at Southeast Asia. Of course, you must first have a product that is scalable, a good market fit and something people actually need. And a good team! If possible, have a co-founder that is a CTO. You should probably also have a good foundation to position yourself as a regional company. You pitch that you are a startup that can scale regionally and your product doesn’t only work in Cambodia but it can work in other countries as well. However, It’s not just only about receiving investments. You must get sizable investments that doesn’t dilute your share that much to get a good foundation. And if you have an idea, start now! Don’t wait. Just start – you learn from all the mistakes along the way. Each mistake teaches you something. And that concludes our interview with Mr Vichet In, the co-founder of Khmerlaod, Myanmarload, and possibly even VietnamLoad or LaosLoad in the future! Geeks in Cambodia is extremely proud of Khmerload and the path it has paved for other Cambodian startups to receive international investments and expand globally. We are rooting for all other startups and budding entrepreneurs out there, and just like Mr Vichet said – start now!